A unique place for couples to get away with hot tubs, king size beds, fireplace and more... is this what you are looking for? 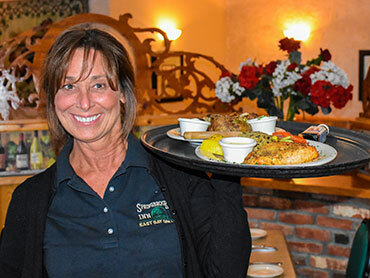 The Springbrook Inn is located near Houghton Lake, Michigan's largest inland lake, Higgins Lake and St. Helen Lake. The Inn offers 7 luxury rooms, casual fine dining on premise, an outdoor all-year-round tiki bar, lovely perennial gardens, a beautiful koi fish pond with waterfall and gazebo. Springbrook Inn rests on 5 beautiful wooded acres of pines. Relax, rejuvenate and have fun all at one destination. This ultimate luxury inn is just what you need to rekindle the romance and rejuvenate yourselves. The Inn was built in 1988 and we (Matt & Kathy Grover) took over ownership in 2001. In our first few years we made many enhancements to the Springbrook Inn. All the changes we made were with you in mind. One of our biggest compliments is the attention to detail. Our goal is to make your stay pleasant and memorable. With lives so hectic and busy we want you to leave refreshed and ready to take the world on again. Our restaurant called the East Bay Grille is on premises and known locally as ‘The Best Food In Town”. The restaurant is elegant dining in a casual atmosphere. We have a wide variety of wines and of course beer and liquor too. Springbrook Inn has 7 luxury rooms, each with king size bed, fireplace, bathroom, balcony, HDTV/Cable and much more. Some rooms have a hot tub or a microwave and refrigerator. Our room rates range from $139 to $239 with some nights including dinner and every morning includes a delicious hot breakfast served right to your door! The Caribbean comes to Houghton Lake! 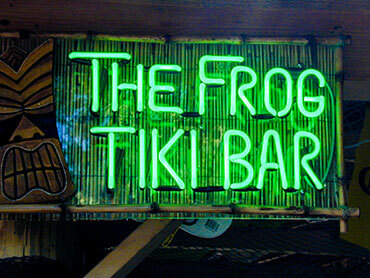 The Frog outdoor tiki bar has a great grill menu and the décor makes you feel like you are on an island somewhere in the Caribbean. Throughout the year we host many events: trivia, comedy, beer & wine tasting and more. Many great memories have been made and everybody leaves with a new friend or two!